In the rural provinces of the Philippines, a nonprofit microfinance institution is making a difference in the lives of poor families. When Super Typhoon Yolanda struck in November 2013, their house was swamped by the sea and their two young daughters were swept away. A third was pulled away by the current, wrenched from her mother’s arms. Of their four children, only one managed to survive the traumatizing storm. Regis’ mom and an aunt likewise did not make it. Such devastating scenes were replicated across the nation. Poor families who were already struggling lost everything. How can they rebuild – not just homes, but livelihoods? And in an economic landscape where only the rich are thriving, how can the Philippines create inclusive growth for those at the base of the pyramid? As I pondered these questions and more following the recent Philippine presidential election, Richard Dee (my fellow Wharton MBA 1989 graduate) approached me to do some consulting work for ASA Philippines Foundation, a nonprofit institution specializing in microfinance. Microfinance refers to an array of financial services, including uncollateralized loans, savings and insurance, which target the enterprising poor whose financial needs are not served by traditional banks due to the higher risks involved. Microfinance is not simply about providing financial services – it encompasses a broader perspective of social development and poverty alleviation. Here then was one solution staring me in the face: a financial services industry which is inclusive, which also serves low-income or unemployed individuals who lack the necessary resources to secure traditional credit and other financial products like insurance, can play an important role in the government’s drive to achieve inclusive growth. As I started working on my project, writing the foundation’s first ever annual report, I got to meet and interview the foundation’s clients. I saw first-hand how much of an impact ASA Philippines has made in transforming the lives of the very poor—and what an impact it has been! In 2015, 11 short years from its inception, the foundation created history by becoming the first microfinance institution (MFI) in the country to achieve a milestone of over one million clients – helping families like Marilyn and Regis to achieve financial stability and success. ASA Philippines is also the first MFI to establish a presence in all provinces of the Philippines. The primary services of the foundation include loans and a micro savings service designed to aid poor families to save for the future in order to prepare for essentials such as education, medical needs, or even family emergencies. The supplementary CSR activities of the foundation comprise a far longer list, including a scholarship program, disaster relief funds, hospitalization and death assistance, and business development training products for aspiring entrepreneurs. The foundation is a prime example of an institution that is able to achieve both a positive financial return and a positive social impact. How then is ASA Philippines able to do well and do good at the same time, in an industry traditionally regarded as risky? The foundation focused on two key areas: Developing a superior product to quickly grow its client base and meet vital financial needs; and building a highly dedicated team of energetic, motivated microfinance/loan officers who serve as the institution’s front-line workers in face-to-face interactions with clients. ASA Philippines is now the country’s largest MFI in terms of borrowers and assets. It just won a prestigious award this August as the Philippines’ most outstanding microfinance institution. But more than the milestones and awards, the foundation focuses on staying true to its name — the Filipino and Bengali word “asa” means hope — by bringing hope to and uplifting the lives of the very poor. Take for example, the story of Marilyn and her family. 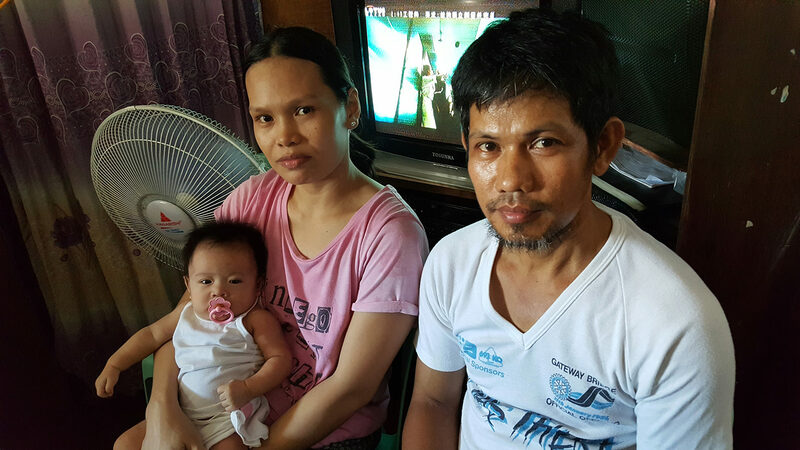 After the typhoon, ASA Philippines provided rehabilitation assistance which included a small grant as well as an interest-free loan for Marilyn and Regis to rebuild their house on higher ground, farther away from the water. They sourced wood fragments, galvanized iron sheets and other scrap materials. It took them a year to rebuild. Two years later, they were back on their feet and beginning to thrive. By 2015, Marilyn had a larger ₱25,000 loan with ASA Philippines. Part of the funds helped launch their own business, a local variety store. The couple now has their own tricycle which they acquired on mortgage. In three months’ time, they will fully own the tricycle. Regis minds the variety store in the daytime and drives passengers in his tricycle at night. Today, thanks to a series of microfinance products, their house has the conveniences of a modern life: a washing machine, toilet, TV, stereo, electric fan and rice cooker. They have a healthy savings account with ASA Philippines, and are saving for their daughter and brand new baby’s future. Best of all, their house has become a home once more. Barbara Custodio is a Wharton MBA 1989 graduate. She has worked in Washington D.C. for the International Finance Corporation and Amtrak; in Hong Kong for Chase Manhattan, Merrill Lynch and Deutsche Bank; and in the Philippines as consultant to the Speaker of the House of Representatives and ASA Philippines Foundation.